Home/Do You Want to Have Your Colors Done? Color analysis in the fashion and cosmetics industry, also called skin, hair and eye tone color-matching, personal color or seasonal color, is the process of finding colors of clothing and makeup to enhance a person's skin tone, hair tone and eye tone. The goal is to determine the colors that best suit an individual's natural coloring, and the result is often used as an aid to wardrobe shopping and planning, closet organization and custom color palettes. Your Custom Color Palette can be “Your Personal Shopper” as you carry it with you on your shopping trips. Color analysis was most popular in the early 1980’s. It has made a resurgence in the following years, and yet so many have no idea what it is. We have offered Color Analysis here at Colors For Success since 1989. The goal of Color Analysis and a Custom Color Palette is to feel good about yourself and to enhance what you have; not try to make yourself into something you’re not. There are a wide variety of approaches to analyzing personal coloring. At Colors For Success, we have offered numerous color palettes, always advancing with the latest color concept. The most well-known is "seasonal" color analysis, which places individual coloring into four general categories: Winter, Spring, Summer and Autumn. At Colors For Success, we go many steps beyond with custom color analysis based on Skin, Hair and Eye colors. 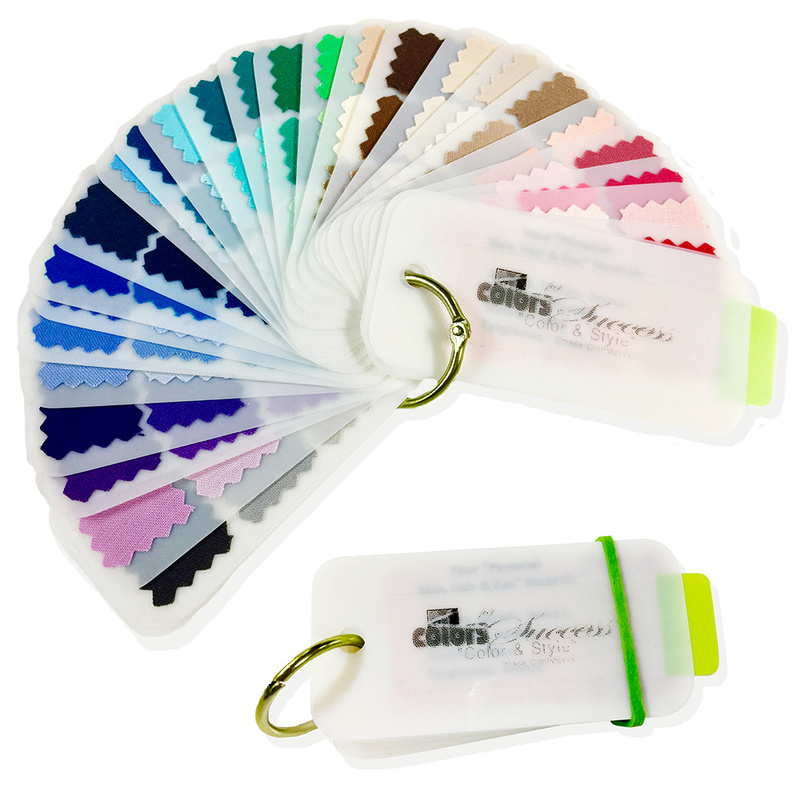 We have offered numerous styles of color palettes through the years and now feel the best color palettes are the ones we now offer with fabric colors which make it easier to match to a garment rather than paper or plastic color palettes. We use over 200 fabric drapes to match a client and to determine an individual’s best clothing and cosmetic colors. It is amazing how true the concept is. Clients will see it! It is always my goal to explain what we’re looking for so clients will understand it. In addition to clothing and cosmetics, colors are also applicable to accessories, metals, hosiery, gem stones, shoes and much more. More recent systems subdivide the seasons into 12 or 16 categories, but at Colors For Success we are completely custom. We color match you personally, color-by-color. Many different versions of seasonal analysis have been developed and promoted by image and color consultants worldwide. Some color analysis systems classify an individual's personal combination of skin color, hair color, eye color referring to a color's “temperature” (cool blue vs. warm yellow) and the degree to which the hair, skin and eye colors contrast. Color Analysis determines colors that flatter and also illustrates colors that are not flattering. Colors that are not suitable for an individual can make a person look pale, or draw attention to such flaws as wrinkles or uneven skin tone. A person can look sick, tired, lack esteem, etc., with the wrong colors. Although Color Analysis can limit wardrobe color choices that do not enhance an individual’s coloring, it will result in many colors that will coordinate with an individual’s coloring. The result will definitely save time and money while shopping, and will also result in an amazingly organized closet. When you think of the cost and compare it to manicures, pedicures, hair coloring, Color Analysis is considerably cheaper since it is generally a one-time expense. As you age you may find changes in your coloring simply due to aging, when our skin can become more sallow and our eyes can look less vibrant. It can be helpful in that case to redo your Color Analysis. I have found that individuals learn that your personal hair color most often works best for you. When you do choose to color it, it is best not to stray too far away from your original hair color; it can be lightened by selecting the correct hair color to enhance. You will be able to shop for sales that make sense and not be tempted to purchase sale items that you will probably never wear. I know that we have all experienced those sale items we wear once then keep in the closet to take up valuable space, wear them again months (or years) later only to find we still don’t like them… but we keep them! The same is true with cosmetics; none of us need tons of colors but only the very best that enhance our personal coloring. Since not all of you live nearby, we are also offering Color Analysis on Skype or FaceTime. For more information or if you have any questions, please feel free to call 800-707-3378 (603-898-3378 in NH) at no obligation.